Accurate and complete edition, all 14 books in one volume, in the most exact way possible today according to the manuscripts we have at hand, without elucidation. The Mishneh Torah by Maimonides is a summary of the oral Torah, it contains 14 books (hence the nickname “HaYad HaHazaka”). The Mishne Torah is a masterpiece of the splendid torah, in its full glory, there was none like it before, and none like it since, absolute perfection: in the scope of the topics, in its neat sorting, in its polished language and the accuracy of the descriptions and Nusach. This is Maimonides’ materpiece, the book contains all matters of Jewish law and the main elements of Maimonides philosophy, in this time and in the mashiahs time may he come soon. The book has merited extensive interpretation and is considered the fundamental book of halachick rulings. The popular edition of the Mishne Torah (the printed edition) is very faulty, due to the christian censorship and due to the “corrections” that were added over the years. Now all 1000 of its chapters (exactly!) with accuracy second to none – In one easily accessible for each study, with many indicies and a friendly and beautiful design. 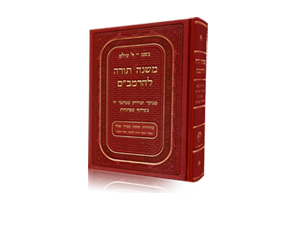 The accurate nusach is based on Rav Kapahs edition, while comparing the nusach in his edition to that of the accurate manuscripts, especially the Yemenite ones which are known for their reliability. And the manuscript signed by Maimonides of The Book Of Knowledge and The Book Of Love. In this Nusach the changes made by christian censorship and thousands of other disruptions were fixed. The Nusach is vowelized, punctuated and elucidated. The book comes in one volume which allows scanning through its chapters quickly. Pearl size (24X17 cm), for ease of use and carry. According to the original division found in manuscripts, in Rav Kapahs edition and precise compared to other editions. Each hand written law received its own paragraph. In this edition the numbering is according to the pattern of the common Vilna distribution, therefore the numberings in this edition are sometimes in the middle of the law. Only the most significant ones (one every few chapters) are marked in the page margins, from other quality editions: Yad Peshuta edition by Rabbi Rabinovitch(= י); Accurate Rambam Edition by Rabbi Shilat (= ש) manuscripts presented in Frankel’s edition and Machone Mamre’s editon (= מ), Kapach’s edition (= ק), and Oxford manuscripts. Also marked are Kama and Batra’s nusachs (= מה”ב and מה”ק). In addition we added nusach comments according to Maimonides and his descendants answers (ר”א = R. Abraham ben Moses ben Maimon ר”י הנגיד= R. Joshua HaNagid), and the nusachs of publishers. Redrawn carefully and true to the source.All the passages in the Torah rewritten carefully and true the source. All verses are vowelized according to the Massora edition and citated. In addition the changes from the Massora edition are noted.Quotations (often combined with verses) are indicated in full including internal references according to Maimonides in the following language “as we explained”. Indices of the Maimonides’ books, division of the Jewish laws, 613 commandments, chapter heads in alphabetical order and ordered by laws, an index of sizes and weights words of introduction are found at the beginning of every index. Beginnings of the three chapters a day portion are marked in the margins, and in the introduction it states which chapter for the one chapter a day learners.